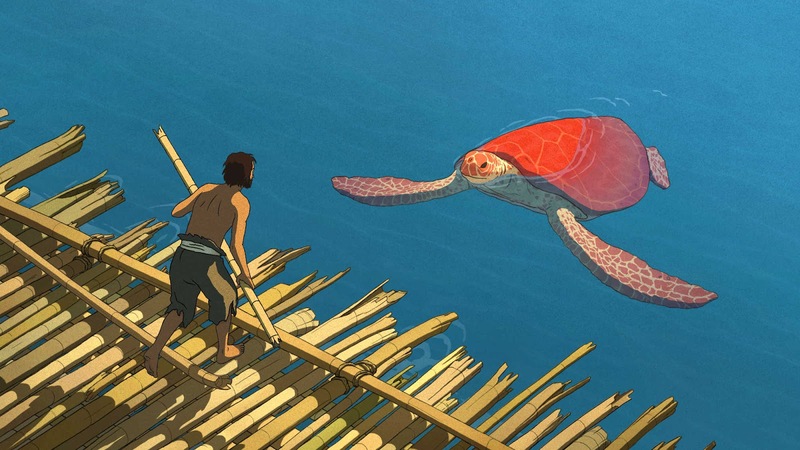 Studio Ghibli's latest sees Dutch British director Michael Dudok de Witt taking on the story of a castaway on an island. As the film begins, in greying waters and stormy seas, the man is tossed asunder, his boat ripped from him. Clutching onto it, he makes it to shore - albeit on a completely deserted island. Woken the next day by a crab running up his leg, the man plots to escape, using bamboo canes to make a raft. 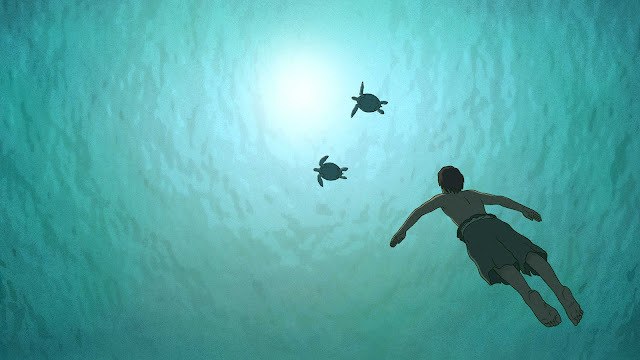 Mixing existentialism, some sumptuous hand drawn and painted animation, facials that look similar to Herge's Tintin executions and all scored to a lushly mournful and occasionally soaring soundtrack, the animation The Red Turtle is wordless and will leave you breathless. While comedy of the occasion is provided by a clutch of crabs scuttling back and forth in the castaway's world, the soar-away visuals of the castaway's plight, his midnight delusions and what happens may have a propensity to hit where it counts - in the heartstrings. As the survival tale plays out over its 80 minute duration, there's Laurent Perez del Mar's soundtrack to send you into orchestrated orbit as the simple story unfurls. It's a meditation of existence and of soul-searching as the castaway adapts to the rhythms of the island and the machinations of survival - but some of this may go over younger minds heads even if they are willing to go with the animated flow. Ultimately though, The Red Turtle is a film that has deeper meaning, and will be a personal tale to each member of the audience. It's a rumination on our place in the world, and acceptance thereof; all beautifully encapsulated in a Studio Ghibli hand-drawn co-production that once again hits the heart strings and engages the brain so much - even when it offers so little by way of execution.